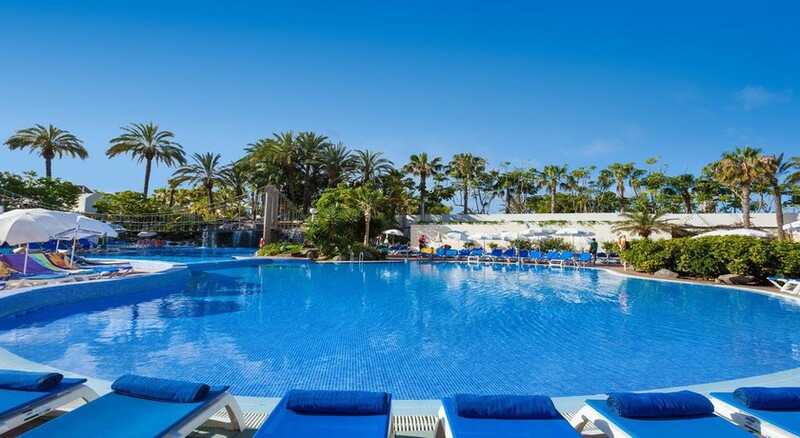 At a distance of 300 m from the fantastic Las Vistas Beach, lies the Best Tenerife Hotel, which is one of the best options to spend your holidays in Tenerife. Strategically nestled among elegant parks and gardens, the hotel offers a relaxed atmosphere to all its guests. With delicately designed accommodations to suit the needs of guests of all ages and tastes, this 4-star establishment features twin rooms equipped with air conditioning, direct-dial telephone connections, satellite TV sets and majestic windows with breath-taking views. During your stay at Best Tenerife, you can also choose to unwind on marvellous beaches and indulge in adventure at either Aqualand in Las Americas or Tenerife’s Zoo and Jungle Park. Further, the hotel’s proximity to a handful of advanced golf courses makes it a golfer’s paradise in Tenerife. 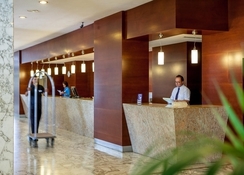 Strategically located at 16 km from Reina Sofia International Airport, the hotel is easily accessible by road from all the major cities of the Canary Islands. Best Tenerife Hotel is located at a distance of 300 m from the fantastic Las Vistas Beach. The hotel has got a magnificent seafront that takes you to the centre of Playa De Las Americas. Nearest airport, Reina Sofia International is just 16 km from the hotel. The rooms of the hotel are divided into the following categories: Twin Room, Twin Room with Pool View, Triple Room with pool view, Superior Triple Room with Pool View, Quadruple Room with Pool view and Superior Quadruple Room with Pool view. The rooms at the hotel have a minimum occupancy of 3. These rooms are well equipped with all modern amenities such as satellite TV sets, direct-dial telephone connections, hair dryers and electronic safes. The rooms also come with en-suite bathrooms. 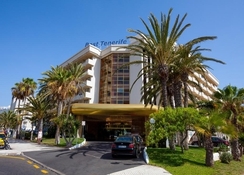 The Best Tenerife Hotel provides half-board accommodations with an additional option for full board. 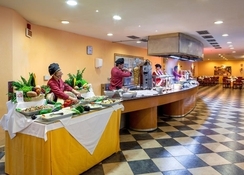 Hotel’s on-site restaurant serves delicious buffet for breakfast and dinner. The restaurant also hosts cooking shows for its guests. Sun loungers and sun terraces with large swimming pools, which are partially heated in winters greets the guests at the Best Tenerife Hotel. For fitness, the hotel has a gym where you can sweat it out. A gaming room and a kid’s club help the young guests keep busy. Besides, there is also a squash court, table tennis and squash facilities. Rates and conditions are only valid for UK passport holders. All cards are accepted for payment at this hotel. With a few days annual leave remaining a weeks stay in the hotel best Tenerife was absolutely great. Lots of entertainment for my son and a great hotel feel. The bar staff were helpful and provided milk for my baby sons bottle when required. Didn’t stay all inclusive as we like to eat out but was a great experience. Awesome hotel if I had to fault something it would be the food some nights not a lot of choice. Everything else was 1st class great pool and surroundings and very helpful and pleasant staff. lovely time - room fab - entertainment was very good - will be going back !!!! Lovely hotel and staff, the adult pool though isn’t heated so if out of season it’s a freezer! If you wish to use the roof top you have to pay extra, we did, it was nice to get away the hustle and you have use of the bar up there but the mini plunge pool again are not heated so can be a shock, the food is the general over mixture for different nationalities tastes, all staff are very friendly and polite and the hotel is in a good location to all other interests.